Indie rockers from Scottish Glasgow. Franz Ferdinand is a cartoon character (a lion with a somewhat subordinate role in the series Alfred J. Quack), but for their band name the men of Franz Ferdinand were inspired by a different character: the tragic figure of Austrian Crown Prince and Archduke Franz Ferdinand. 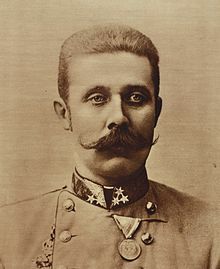 This ardent hunter - he once shot 59 boar and was furious that number 60 had eluded him – and pretender to the throne became the prey of the Serbian nationalist Gavrilo Princip (name giver of the concept of 'principle'), who shot him on 28 June 1914 in Sarajevo (Bosnia-Herzegovina). Austria declared war on Serbia. Not long after the First World War broke out.